As we head into the holidays, the cool, rainy weather and 10 horses who all need to change their names to “Fluffy”, my heart is full of gratitude. 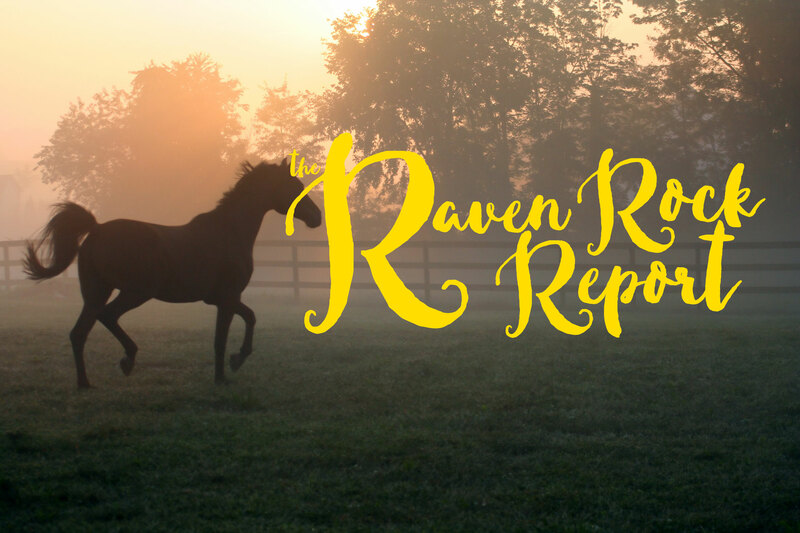 There has been an avalanche of blessings that have come upon Raven Rock Ranch. My Dad always said that, “…the harder I work, the luckier I get.” Perhaps I would change that just a bit- the harder we work, the more blessings we receive. Blessings they are, for sure, but we have put in the hard work to see our dreams coming true. Beginning with the 6th Annual Fundraising Event held at Chateau Ste. Michelle on October 14. This year, we had our first ever live auction. Never having attempted an auction, I had my trepidations about the scope of work, the people we would need to get this accomplished and the outcome. Others who have done these fundraising events have told me the sheer number of people needed to make it all happen and I was very intimidated. But my wonderful RRR staff and volunteers not only pulled it off, but hit it out of the park! The planning by the auction committee and the implementation of that plan by some very KEY people- Tim M., Larry Snyder, Sandy and Buddy Gilbert, Katrina and Josh Hardy, Judy Manson, Betty Bordner, Tim Jackson, Kimbrough and Pasquale Vitelli, Karilyn and John Dammarell, Belinda Jensen and Madison Rus- was phenomenal! These are the people who made it all possible. They carried out the multitude of tasks that it takes to have a fun, smooth-running and SUCCESSFUL event. We also had a cadre of very talented and important volunteers and staff who did so much of the work to make it one of the best evenings most of the attendees have ever experienced. I know that for a fact, as Tim and I called everyone who attended to personally thank them for their support. I offer a HUGE thank you to all who made this Annual fundraiser a BLAST! But what you really want to know is: how much did we realize after all expenses? We came in just under $100,000! YES! IT IS ONE OF THE MANY MIRACLES I have seen in the 6 years that Raven Rock has been in existence. Yikes. Now we can finish the Family Center and add staffing to create and implement new Family-centered programs for the coming year. We have realized that if we have hurting kids, we have hurting parents and troubled siblings. We want to be a lifeline to our families and now we can. Thanks to the overwhelming support from the 130 attendees at the auction and the fabulous staff and volunteers who made it all happen. I can never thank all of those people enough for their selflessness in helping the horses, children and families that I love. It is my greatest joy to report that we have been able to add 4 new children within the last few weeks. Each one Is very unique, and each one has had some devastating trauma that they must process through at such a young age. It is not unusual for a child to come to us whose parent was murdered in front of them, or has lost a parent to suicide or drug abuse. Such horrible things should never happen to people under the age of 18. One such child came to us recently. Her father committed suicide and her mother is an active heroin user. When I looked at this thin, somber child, I was reminded that I am on sacred ground here at Raven Rock. I don’t believe anyone can treat these precious children without holding tightly onto the hand of Father God. I am so clear that I can’t heal anyone’s wounds that are so deep, so raw. But I am also aware that I don’t do it alone. I have a wonderful staff, fabulous horse “counselors” and a God who loves these children more than I can comprehend. After just one session, her Grandmother reported that she was smiling, laughing and chatting with her. Grandma saw joy that had gone missing for quite a long time. Tears welled up in our eyes. We both knew that this is just the beginning, just a start to healing. If you are reading this letter, you are one of our cherished and beloved supporters. We couldn’t do it without you! Sincere gratitude to each of you!